Courier company Hermes has announced a trial of self-driving robots in the London borough of Southwark. The six-wheeled robots from Starship Technologies will be used to collect parcels rather than deliver them. The project follows a pilot scheme in Germany in which the robots delivered parcels to several suburbs in the city of Hamburg. But one expert suggested there might be a backlash if the facility became commonplace. "At the moment, in big cities, it can be hard to walk down the street because of the number of people," commented Prof Andy Miah, from the University of Salford's School of Environment and Life Sciences. "In time, it could be the robots we are trying to dodge. I'm not sure that would be a better world." 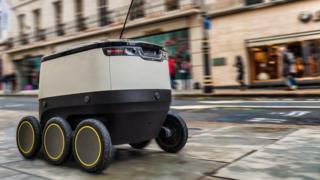 Starship Technologies' machines are already used by Just Eat for food deliveries in parts of London. They are 55cm (22in) tall and 70cm (28in) long. They weigh 18kg (40lb), and can travel at up to 4mph (6.4km/h). Hermes is only using the robots within a two-mile radius of its control centres, in a limited number of 30-minute collection slots to see how they cope with tight turnarounds. Each robot will be able to carry a maximum of 10kg in cargo in a secure compartment, which customers can access using a code sent to their smartphones. The self-driving robots are thought to have several advantages over aerial drones, from being able to carry heavier payloads to being less likely to fall foul of aviation laws. "In the sky, we still have to figure out what a drone highway would look like and figure out some sophisticated collision-avoidance technology," noted Prof Miah. By contrast, Starship's ground-based robots will be kept under close supervision by human operators. Each supervisor will watch over three robots via their on-board cameras and take control of road-crossings and other challenging situations. In time, however, Starship says one operator should be able to control up to 100 robots, which would make its operation more cost effective.